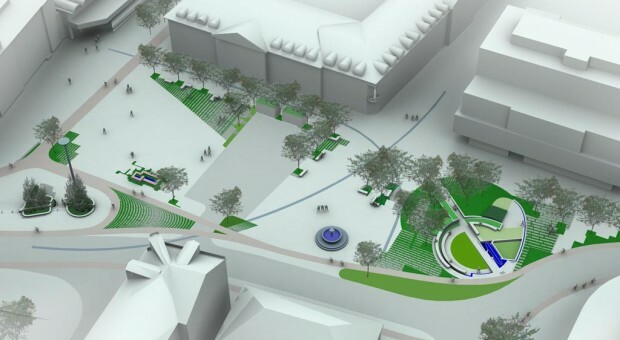 Michael Singer Studio was invited to propose a design for Strømsø Square in Drammen, Norway as a part of an international competition. Rather than a singular object based approach, the Studio elected to create a holistic response to Strømsø Square and areas beyond the site, The proposal notes the transformation of Drammen, once a heavy industrial city, and uses its recent regeneration as the driving concept behind the plan. At the heart of the project is an urban landscape that captures storm water, filtering and improving the water quality before it is discharged into the river close to the site. Elements of the design reflect the social and natural history of the area by referencing places lost to history such as the square’s central water well and the native landscape. The design responds to the extreme seasonal climate changes of Norway by creating water elements that freeze and thaw. In the winter the design utilizes an underground network of industrial waste heat to warm public spaces, remove ice from walking areas and provide veils of steam to enhance night lighting. The proposal references Jan Gehl’s larger City Axis strategy for Drammen and affirms the City planners’ attention to movement throughout the site. The proposal presents public art as a means to feature specific environmental, cultural, and social strategies that can actively contribute to a City’s livability as well as identity.